Defiance: Shadowrun or d20 Modern? Watched episode 1 of Defiance on The-Channel-Previously-Known-as-Sci-Fi. I'm trying to decide if they were doing an alternate background for Shadowrun or d20 Modern. It was pretty basic storytelling. They really crammed too much into the 2 hours of the show. I think they would have been better served making everything they put into the first episode into the first season. This would have provided more depth to the town, the characters, and the personal relationships between the characters. See the first season of Deadwood for a good example of how this is done. By the way, it is fairly clear that Defiance borrows heavily from Deadwood. (Plus some Shakespeare and some westerns/samurai stories: Yojimbo/A Fistful of Dollars/Last Man Standing - I'm looking at you.) They need a better Al Swearengen as the one they have is kind of bland. The riff on the drow and what a female led society that lets the men think they are in charge looks like is interesting, but I did not see enough to determine if it is a cultural trait or just that particular couple. Also, I've driven through St. Louis, so I know what the terrain looks like. It is a river plain adjacent to the Mississippi, not a valley surrounded by cliffs and hills. They may try to hand wave this as part of the terraforming the aliens started (and might or might not have finished), but that seems unlikely. Anything that would have raised those formations would have been enough to drop the arch entirely. I'm striking this up to "filmed in Canada". Those are my initial thoughts on the show. I'm probably not going to watch any more episodes as it did not have that "must see what comes next" vibe. To get back to my original question - I think the show models an alternate Shadowrun setting more than d20 Modern. It looks like they are substituting high tech and psionics for magic, but it is hard to tell from the first episode (too much exposition, not enough doing). The aliens are all here and have been for 33 years at the point the story picks up, which lines up with Shadowrun more than d20 Modern. d20 Modern assumes more "fantasy races" are bleeding through from the shadow realm over time, whereas Shadowrun has the goblinization event and then it's done. The technology is a post-apocalypse mix, so there is a mix of ultra-tech and low tech. As with any post-apocalypse world, good alcohol is hard to find, but bullets are always available. Most of the people in Defiance (the town) have pistols (if they are human) or energy blades and maybe energy rifles (for the non-humans). The big horde o' bad guys at the end are all body armor and energy weapons like space orcs ought to be (no, they are not called orcs, but really, look at them). This, to me, leans more towards Shadowrun's mixture of high tech and social regression rather than d20 Modern's more "world behind the world" vibe. That's it for now. I'm still recovering from a cold I came down with last Saturday, so my thoughts a bit more scattered. Later! Here is the second of two maps of the starting areas. They are representative of what the players will get as a starting map. This one is notable for its blank spaces. The "entrepreneurial seafarers" (read: "pirates") that make up most of Lucan's Clock for the most part don't care about what's beyond the coast. They can see a big range of mountains deeper in and have notated them on their maps, but they're seafarers, not landlubbers. The Valley of the Landsharks was a promising spot for a colony...until the eponymous landsharks noticed the colony and started treating it like a buffet. There are minor streams and seasonal creeks in the valley so there is water to be had, but little in the way of areas safe from the landsharks. The valley is suspected of being much longer than shown, but no one has explored past the branching of the valley. The Dry Plateau is up above the arable river lands and other than one expedition to verify it did not connect to the Valley of the Landsharks, it has not been particularly explored. Lucan's Clock clings to the cliffs near The Falls, the point where the Farmer River spills over a cliff-side into the bay. There are numerous ledges along the cliff. Some ledges have buildings on them, some just the fronts of structures dug into the cliff. All are connected by (relatively) sturdy bridges and ladders. Most ledges have cranes of various sizes to haul up merchandise from either ships and boats in the bay or from lower ledges (depending upon clearances). The croplands shown almost supply enough food for the colony at a subsistence level (pirates are not very good farmers and the crop yields are low as a result). As the locals want to live better than that, this makes foodstuffs expensive and additional food is purchased from New Zwicke (and sold at a markup) or taken as part of the booty from raided ships. The terrain icons indicate the center points of the hexes at the next scale up (1 hex = 15 miles). I might keep the actual symbols there in the final version of the map I hand to the players, but I will probably just put in a generic symbol of some sort. That should help me keep the mapping accurate as the players explore. 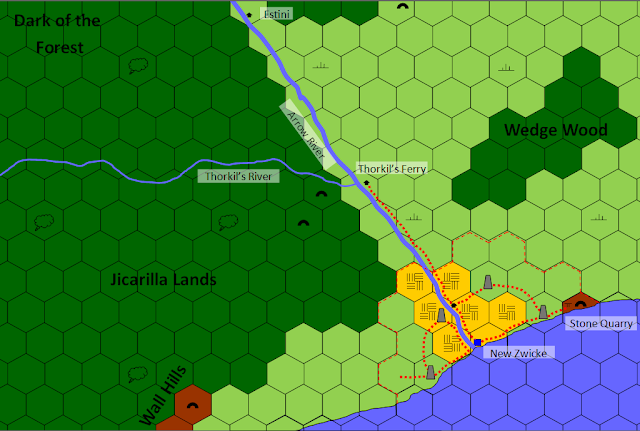 Here is the first of two maps of the starting areas. They are representative of what the players will get as a starting map. There is some coastline missing, but to show it, I'd have to include a bunch of boring unexplored hexes. 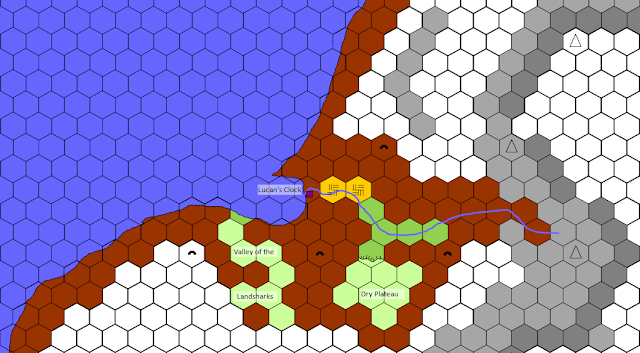 The Jicarilla Lands are the lands the (more or less) friendly lizardmen call home, from Thorkil's River (the colonist's name for the river) south to the coast (just off this map), bounded on the east by the Wall Hills (there's more of the hills, but the colonists have not pushed into that part of the forest to find them). By treaty, colonists may not enter these lands. The Dark of the Forest is comprised of the forests north of Thorkil's River and west of the Arrow River (named by the colonists due to its fairly straight course). The Jicarilla tribes consider the area cursed and will not enter. If the idiot colonists want to enter that area and die, the Jicarilla will let it happen. Estini is a logging village and represents the furthest point of colonial expansion in the area. The lumberjacks here work the North Forest (not labeled), which are to the east of the Arrow River. There is a Stone Quarry to the east of New Zwicke. All those convicted of crimes in New Zwicke are sentenced to work the quarry for a period of time, based on the crime they committed. This is rarely abused by the Governor Governor. So far. New Zwicke is protected by four watchtowers. The thin dashed red line that forms a perimeter around the large town is the limit of The Watch's ability to see and, by definition, the limit of the town's territory. The thicker red dotted lines indicate paved roads. There are numerous unpaved roads amongst the croplands that are not shown. The amount of croplands shown provides a surplus of food, which is sold to merchant vessels stopping at the port. That's it for now. The map for Lucan's Clock will follow no later than Tuesday of next week. I still need to name some areas and put some story behind the area, so it's not ready just yet.